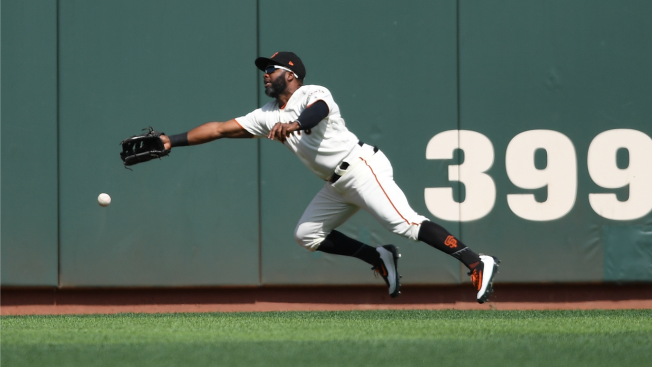 Denard Span #2 of the San Francisco Giants watches the ball fall just out of his reach for a double off the bat of Asdrubal Cabrera #13 of the New York Mets in the top of the first inning at AT&T Park on June 24, 2017 in San Francisco, California. SAN FRANCISCO — The promotion of an intriguing prospect can bring a certain buzz to the ballpark. It didn’t last long. The debut of Ryder Jones came in the latest flat performance from the Giants, who collapsed late and fell 5-2 to the Mets. The loss was their 50th of the season. They did not lose their 50th game last season until August 12. With the score tied in the eighth, Curtis Granderson crushed a leadoff triple into the alley. Sam Dyson walked the next batter and then whiffed Yoenis Cespedes, but Jay Bruce greeted Steven Okert with an RBI single to right. It kept going poorly from there. — Jones grounded out to second in his first at-bat and then flied out to center, grounded out to first, and grounded out to second. He had one chance in the field, starting a double play that ended the second inning. — Johnny Cueto seems to have turned a corner. Over his past two starts, he has allowed just three earned runs over 14 innings. Whether they trade him or not, the Giants certainly could use a nice little hot streak for the next six weeks. — A few seconds after Bruce Bochy shook Cueto’s hand, Brandon Belt got him off the hook for a loss. He hit the first pitch of the bottom of the seventh into the seats in left-center, tying the game. The homer was Belt’s 14th. He’s on pace for 29. — The Mets got eight one-run innings out of Jacob deGrom, who is quietly the most reliable of a star-studded rotation. He struck out seven and gave up just four hits. — If Madison Bumgarner wants another Silver Slugger Award, he’ll have to chase down deGrom, who hit a homer in his last start. His single in the third was his 10th hit, and he finished the day with a .294 average.